Every city has at least a few “best kept secret” or “hidden gem” destinations. 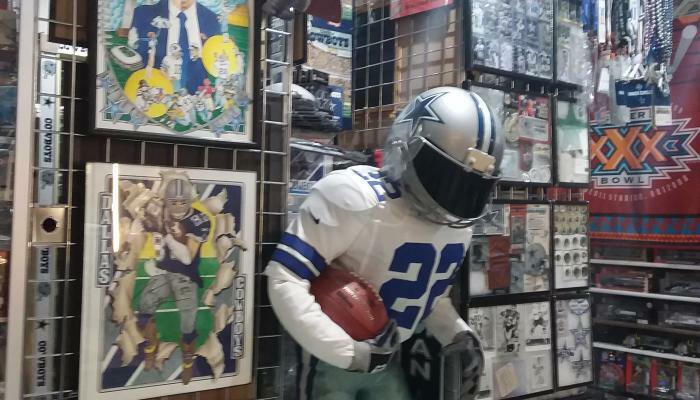 One of the most delightful of these in Arlington is an unofficial museum of Dallas Cowboys memorabilia operated by superfan Stoney Kersh, a local vending machine technician, in his northwest Arlington home located a couple of miles from AT&T Stadium. In addition to Stoney’s amazing collection of Cowboys memorabilia (more on that in a minute), one particularly fun aspect of the Kersh museum is that it’s kind of like going to a cool “underground” destination—most visitors learn about the museum from word of mouth, and there’s no website, limited social media and a hard-to-get phone number. Last month, I paid my first visit and received a guided tour from the man himself. On my way over, I envisioned a setup where the house had a room, maybe two, devoted to Cowboys memorabilia. Boy, was I ever in for a big surprise. I rolled up to find Stoney and his wife, Diana, hosing down the colorful floor mural of Dallas Cowboys football field (they painted it themselves) that runs the entire length of a back patio that also boasts a big screen TV and comfy outdoor seating area perfect for game watching when the weather is fine. The patio also affords a great view of Stoney’s car and motorcycle collection, which includes two Firebirds, a Dodge truck, a Chevy van, and two choppers, all emblazoned with Cowboys-themed art and decals. “Wow, pretty cool!” I said. Then Stoney invited me inside—where I discovered not just one room, not just two rooms, but an ENTIRE HOUSE filled floor to ceiling and wall-to-wall with what surely must be the most impressive Cowboys memorabilia collection on the planet. I’m talking hundreds of collectibles, wearables, readables, drinkables and more that dominate each room of the house, including the kitchen and the bathrooms. There’s even a media room where old games, documentaries and interviews loop non-stop on a TV screen, as well as a free-standing recreation room in Stoney’s backyard that’s tricked out with a game watching area (of course), a bar, and a Cowboys-themed billiard table. Somehow, everything is meticulously organized and displayed in a welcoming, well-kept environment—even if you’re not a fan, it’s truly a sight to see. When and how did you get started collecting Cowboys memorabilia? Stoney Kersh: “I started when I was four years old, right after I went to my first Cowboys game at the old stadium in Irving. When I saw the team take the field and heard the roar of the crowd, I fell in love and never looked back. It was magic. Tell us about some of the items on display at the museum. What are some of the more noteworthy pieces? SK: “I have a huge banner of Jason Witten [Dallas Cowboys tight end 2003-2017] that hung in the Galleria Mall in Dallas—it’s so big I don’t have a place for it right now, but maybe someday. “Another interesting item is a 80s-era Cowboys helmet I pulled out of a junkyard pile. I caught a glimpse of it amongst the stuff they were about to demolish, and I climbed up on a pile of metal to fish it out. How far back does your collection date? Any idea how many items are in your collection, or what it’s worth? SK: “No clue. I’m not in this for the money, so I’ve never taken the trouble to keep count of the collection or get anything appraised. I don’t even charge admission, although I do accept donations to help out with expenses. How do you find all of this great stuff? So who’s your favorite Cowboy? What have you enjoyed the most about welcoming visitors to your home/museum? Would your group like to schedule a tour of Stoney’s magnificent museum? Contact Scott Poland at 817-704-7593 or email scott@arlington.org to find out more. Please call 817-401-3928 to book individual tours.